Young Mansfield Town midfielder Chris Spencer is expected to get much-needed match experience at Evo-Stik Northern Premier League outfit Mickleover Sports on his three month loan. 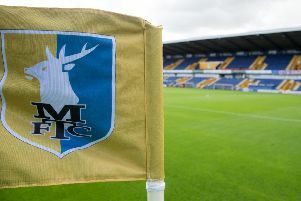 The 18-year-old had spent a one month at Hednesford Town of Vanarama National League North, but Stags were unhappy how little he played there. Boss Adam Murray said: “He went to Hednesford but didn’t get the game time that these moves are supposed to enable the boys to get. But we know the boys down at Mickleover, it’s a lovely playing surface and a really good environment. “It’s a tough environment to work in and they will push them and work them hard. It is another valuable experience for him and, like we are trying to do with a number of our lads, it’s pointless them sitting round here doing nothing. They need to be playing football and be in an environment where the pressure is on to win. “He played 90 minutes last night and they went down to 10 men after about 20 minutes and, to be fair to them, they were awesome and they nicked in in the last minute.